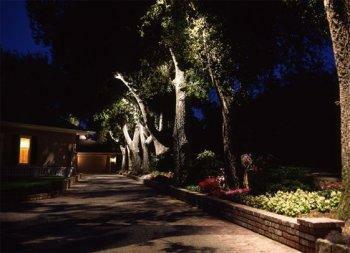 The first decision to be made concerning landscape lighting is the overall effect you are trying to create. This can range from a highly visible, nearly imposing look (below left), to one which is understated and subdued (below right). After deciding the degree of illumination you desire and are comfortable with, you can then pick out the techniques needed to achieve your goals. 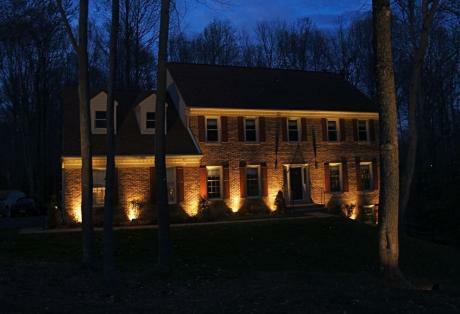 The majority of landscape lighting falls into one of three categories: Up Lighting, Down Lighting, or Path Lighting. Within the categories of Up Lighting and Down Lighting, there are five major techniques: Grazing or Washing, Spot Lighting, Silhouetting, Shadowing, and Moonlighting. Using a variety of these lighting techniques in combination creates a beautiful and secure environment. For each technique there are fixtures that work better than others. The following describes some lighting techniques and the fixtures that best create the desired effects. 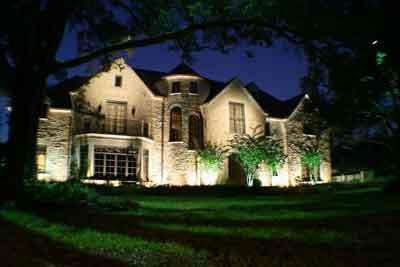 Architectural and landscape elements become visually dramatic features when illuminated from below. Up Lighting is the most common technique used to accent key focal points in the landscape and create shadows on walls. 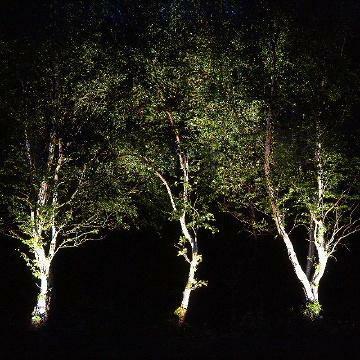 It is often used to illuminate a specimen plant by placing two or more spot light fixtures at the base and angling them upward, illuminating both the bark and canopy. Boulders, sculptures, and garden structures can also be highlighted. Up Lighting is not a natural way of lighting, thus it tends to draw our attention to the object being featured. 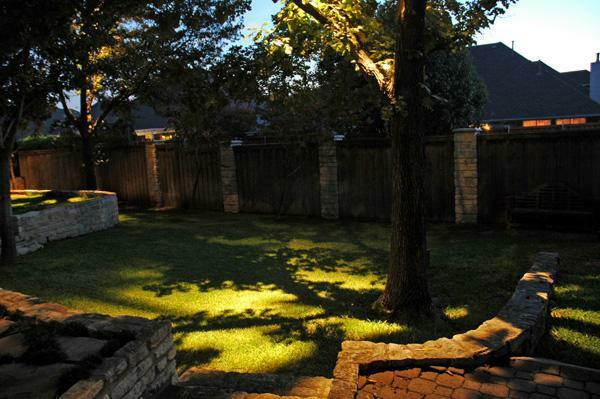 To prevent direct glare, fixtures are aimed away from observers and camouflaged by placing the accent lights behind shrubbery to preserve a natural looking landscape. Like Up Lighting, this is a general term that describes a group of effects that places the illuminating source above the target area. Down Lighting (to the left) can be used to spot specific garden elements and functional areas or to illuminate large spaces for safety, security or recreational purposes. 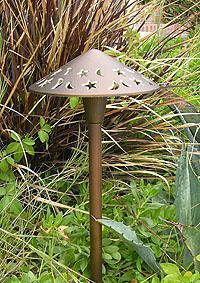 In the garden, diffuse Down Lighting can also be used to create the shadowing patterns of a moon lit night. Overlapping light patterns will soften shadows and create a more uniform lighting effect. 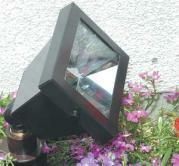 For this effect, mount fixtures to patios, gazebos, facades, eaves, or trees. Grazing or Washing (below) is the diffusing of light over wide vertical elements. It is used to enhance the texture of architectural and natural surfaces. Fixtures are placed 6-8” from the surface with the beam aimed parallel to the surface. 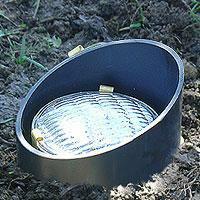 Flood, spot and well lights can be used for Grazing, depending on the width of the area being illuminated. 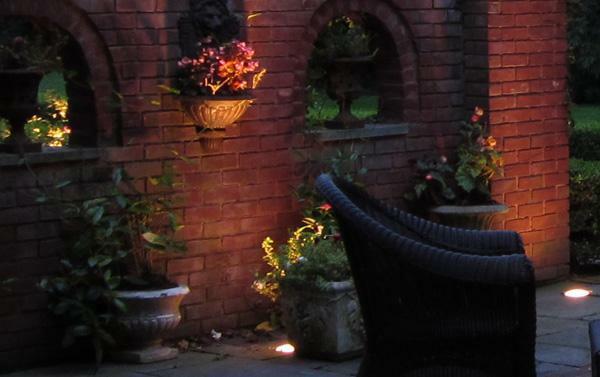 Spot Lighting (see below) is the best way to highlight individual elements of the architecture and garden. Narrowly focused beams of light are used to make select features “pop out” from the background, thus directing the viewer’s attention. Hooded spot fixtures are typically used for this technique. 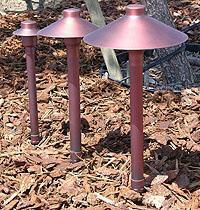 However, well lights and up/down mounted fixtures can be used for vertical elements, such as tree trunks and columns. Silhouetting (right) is when lights are placed behind trees, architectural elements, or other objects so they stand out before a wall, fence, or other surface. This allows the viewer to enjoy the outline form of the object only and creates a dramatic effect when silhouetting plants with unusually shaped leaves or branches as well as vertical plants with regular forms. For this effect, the light source should be placed directly behind the object being silhouetted. Well, spot, or flood fixtures can be used to create this effect. Shadowing (left) is similar to Silhouetting, but with the light in front of plant material that has a tall adjacent wall so that dramatic shadows are created as a back drop. This method of lighting is an excellent choice for young landscapes typical of new construction because it transforms a small plant and a large plain wall into a high drama effect that moves with the wind. Good subjects for Shadowing are plants that have open delicate foliage. Moonlighting (right) creates the most natural form of lighting by positioning a light source high above the garden in trees and diffusing the light down through the leaves and branches, casting graceful shadow patterns on the ground below. 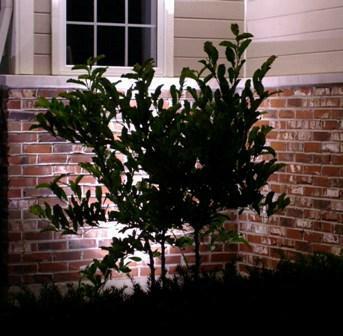 This technique provides a low level, even, ambient illumination typically used over driveways, lawns, and patios. Spot fixtures are typically used for Moonlighting, however, hanging fixtures can also present an interesting effect. Placing fixtures at the edge of hardscape surfaces is an attractive way to light pathways, steps, and driveways, as well as draw attention to hazards such as grade changes. 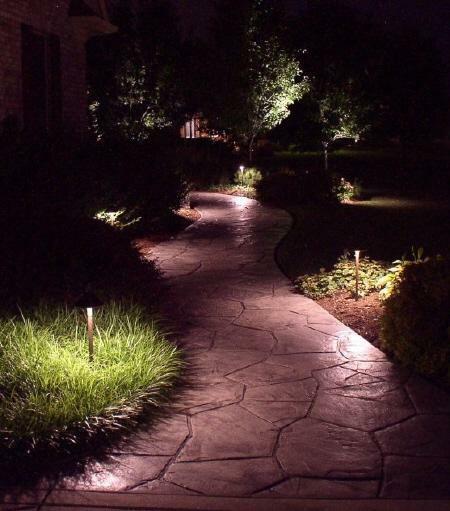 Most path lights are low, capped fixtures that reflect light from under their tops to spread a diffuse circular area of light onto the hardscape and plant material below. The best layout is to stagger fixtures along the edges, alternating from one side to the other, although linear arrangements are sometimes used. They should be spaced far enough apart so that bright regions do not overlap, but not so far that completely dark areas separate them. 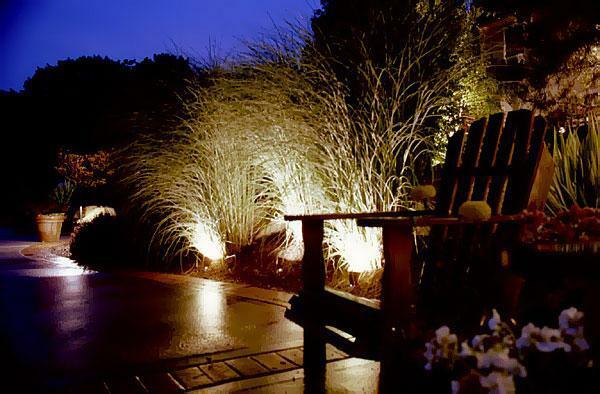 Unlike those used in directional lighting, Path Lighting (left) fixtures are visible, aesthetic elements in the landscape and should be chosen to complement the desired look of the garden. 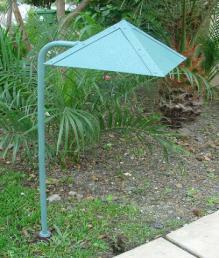 Correspondingly, there is a greater selection of these fixtures then of other landscape lighting fixtures. Also within this category there are some specialty lights, such as insert lights and mount fixtures, which are typically used to safely illuminate steps. 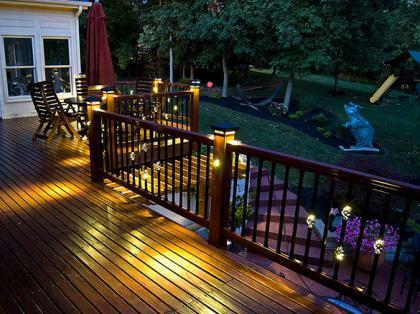 Deck and Step Lighting (right) is another important area of outdoor landscape lighting. 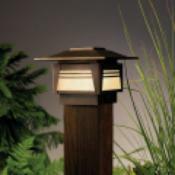 Designed for safety, this lighting clearly illuminates dark, possibly hazardous, areas while highlighting the architectural elements of the deck, veranda, patio, or other structure being targeted. 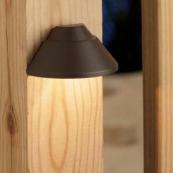 This lighting allows your family and friends to safely navigate within your outdoor living area. Typically, the lights used for illuminating steps and other potential dangers are small, unobtrusive fixtures such as wall inserts or small mounts. Depending on the situation, however, hanging, spot, path, post top, and rope lighting can all be utilized. 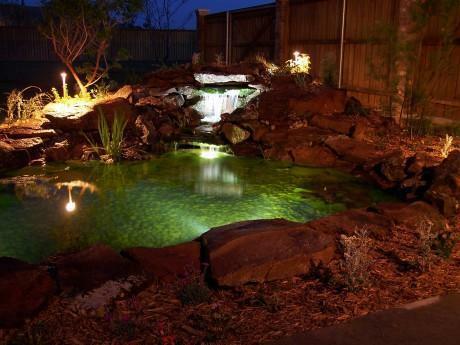 One specialized type of landscape lighting is used in ponds and fountains (below) to create interesting and exciting lighting effects. 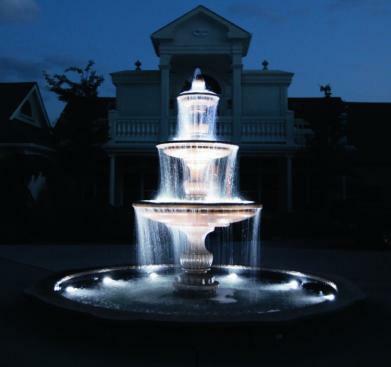 Submersible fixtures range from spot lights which highlight waterfalls and other moving water to flood lights which give the entire body of water a soft glow. Also, color filters can be used with these fixtures to create a more whimsical effect. 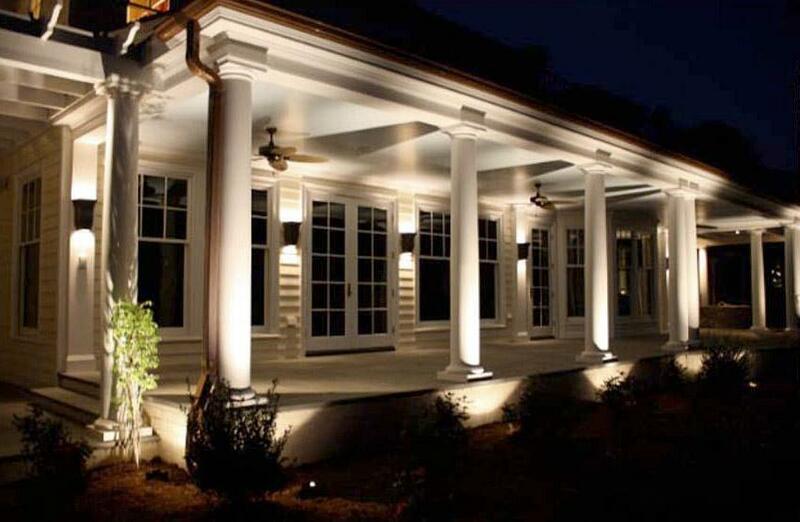 To learn how you can improve your property's appearance with one or more of these landscape lighting techniques, contact the professionals at Botanica Atlanta today for a consultation. Flood - Primarily used for Grazing and Moonlighting but can be used for Spotting, Silhouetting and Shadowing. Typically uses10w-50w 12v JC Bi-Pin Halogen Bulb, but available in LED. Options include hooded models, wall mounting or ground staking fixtures, different body colors and materials, and colored lenses. Well - Primarily used for Spotting and Grazing tall narrow features but can be used for Silhouetting and Shadowing. Typically use incandescent 25w-75w PAR36 lamps but available in LED. Options include enclosed fixtures. Spot - Primarily used for Spotting, Shadowing and Down Light Grazing of narrow features but can be used for Silhouetting and Moonlighting. Typically uses 20w-75w MR16 halogen lamps but available in LED. 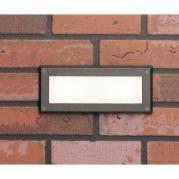 Options include many different body materials, colors, sizes and styles, ground stake or wall mount. Path - Almost exclusively used to illuminate walking areas but can have secondary Spot and Shadowing effects. Typically uses 10w-25w bayonet bulbs but some models available with LED. Options include many different body materials, colors, sizes and styles. Ground stake or deck mount. Bollard - Primarily used along areas with motor vehicle traffic but can be used for foot paths. Typically uses 25, 50, or 75w 12v A Bulbs but available in LED. Options include many different body materials, colors, sizes, and styles. 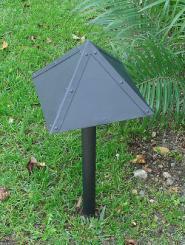 Mounted - Primarily used to illuminate steps, highlight vertical elements and grazing for low walls. Typically uses10w-50w 12v JC Bi-Pin Halogen Bulb but available in LED. Options include many different body materials, colors, sizes and styles including up/down lights. 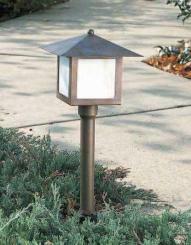 Insert - Primarily used in hardscape applications to delineate and illuminate steps and walls. 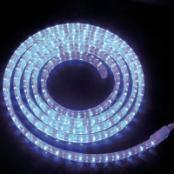 Can be used as floor lighting on decks and patios. Typically uses10w-50w 12v JC Bi-Pin Halogen Bulb but available in LED. Options include body color and width, frosted, clear, or louvered face plate. 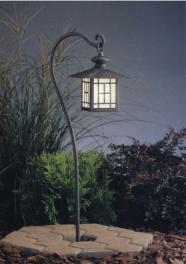 Hanging - Primarily used over garden features like swings or arbors to cast ambient light down. Can also be used en mass hanging from the branches of a large tree. Various bulb types including LED. Options include many different body materials, colors, sizes and styles. Post Top - Use on railing posts for decks and steps. Various bulb types including LED. Options include many different body materials, colors, sizes and styles. Rope - Primarily used to delineate the edges of steps, deck railings, and patios. Can also be used to to delineate branching structures in trees. LED series bulbs. Available in multiple colors. 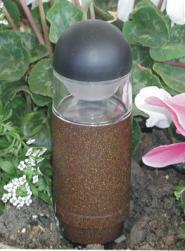 Submersible - Used in water features. Various bulb types including LED. Options include many different body materials, colors, sizes, and styles. 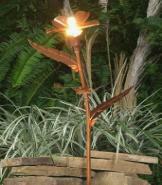 Whimsical - Add a little humor, a hint of fantasy, or sentimental ambiance to your garden. The Internet provides access to a number of novelty lights from gnomes to animals to fanciful flowers.